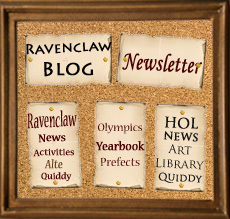 First used in August 2008, the Ravenclaw Blog is the easy solution to inform all students of going-ons in Ravenclaw. As composing an HOL message for every single Ravenclaw student would be much too tedious and time-consuming, Prof. Mark Mandrake created the lovely forum for us. At the beginning of its time, the Ravenclaw Blog was used to announce all quidditch game dates, deadlines for the Alte Sententiam, and more. It is now mainly used for monthly newsletter. Every month, a prefect/professor will go to the Ravenclaw Blog and compile all the happenings within HOL and Ravenclaw house into one fabulous newsletter. Students can easily view almost all of the information they need for the month. If there are contests or similar events going on, links are provided so that students may easily find the source of the activity. Generally, it helps in keeping students active within Ravenclaw, as well as HOL. Before the Ravenclaw Blog, information on what to include in newsletters was distributed to prefects, and they would provide members of their nest with this information. Now, Ravenclaw can be universally informed. The system of the Ravenclaw Blog keeps students having fun, earning points, and making a name for Ravenclaw in an organized manner. Because we have the blog, we don't have to dig through posts in various locations to keep informed. So long as the prefects and staff are here to keep it running, we will easily be able to know just about all there is to know. Overall, make sure you keep up with the Ravenclaw Blog. It's there for a good reason, and the bigwigs of Ravenclaw work hard to keep things the way they are.